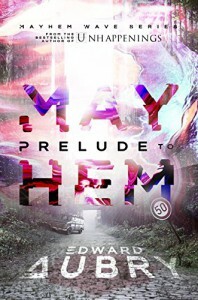 Apocalyptic tales are right up my alley, so I was expecting a lot from Prelude To Mayham, but was a bit disappointed in the end, as it all felt very messy and a bit too much of everything. The premise is good. After an end-of-the-world event in which most of the humans disappear but which doesn't seem to bad overall, the surviving humans try to survive. One of them is broadcasting a radio message to encourage people to come to Chicago. However, it turns out that this event also led to some magic events (and this is where it starts to become a bit messy). Glimmer is fine, but there is very little talk about magic in the beginning and in the end it all gets thrown in to the story seemingly random. Also, the ending kind of disappointed me. What I did like were the characters, and not even the characters per se, but that they were a mixture of small children, teenagers and adults, instead of the almost compulsory group of Young Adults that seem to roam these books nowadays. Glimmer was also a lot of fun. Thanks to the publisher for providing me with a free copy of this book in exchange for an honest review!